I had other things I wanted to post today, but my brain isn't functioning enough to bring them to fruition. This cold has caught me in its sticky web, and like a small bug, at first I felt just a glimmer of hope that I could wrangle myself free. But today I have to acquiesce. I'm caught. I'm sick. I need more kleenex and a cup of hot tea and a good lie down on the couch. What I really need is some mindless knitting to go along with that... the kind I can put down in between blowing my nose, sipping my tea, and petting the cat. I've just finished mailing off a host of new baby presents, and I have nothing simple on the needles. I've been knitting baby presents nonstop for over a year now. I don't know what water source all our friends seem to be tapped into, but I almost feel as if I've forgotten how to knit anything but baby gifts. 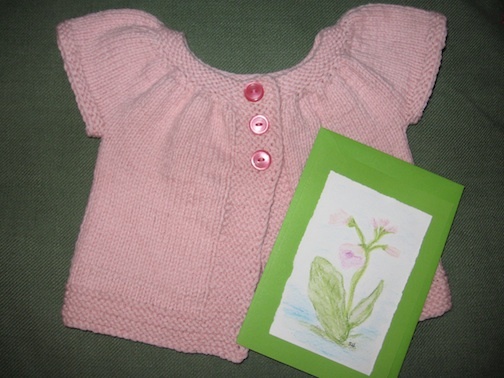 A Baby Kina for a baby in Switzerland. A little top-down raglan sweater for a baby in Germany. An old friend in Hamburg has been wanting to be a dad for awhile, so sending something for his newborn son was a pretty big deal. The girls wanted to knit something as well, so Moonshine knit her first pair of socks: Baby Socks from More Last-Minute Knitted Gifts. 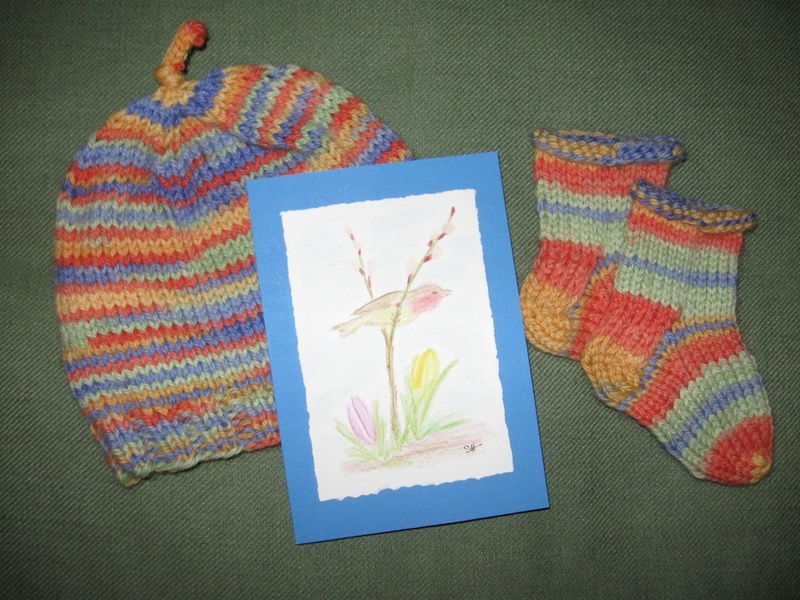 And Sunburst, a bit forlorn that she couldn't knit the socks, knit this sweet hat: Basic Baby Hat. The sock pattern was one of the simplest yet, and Moonshine was pretty pleased with herself. As she should be-- I think they look fantastic! It's amazing to watch these children transition from their first wobbly stitches all the way to their first pair of socks. And what's even better is that they know it. You can see it in their eyes. Moonshine just stared at them in disbelief when she was finished. "Wow! I actually made these!" And now for that lie down. If my brain is up and running tomorrow, I'll tell you all about the newest knitter in the house. 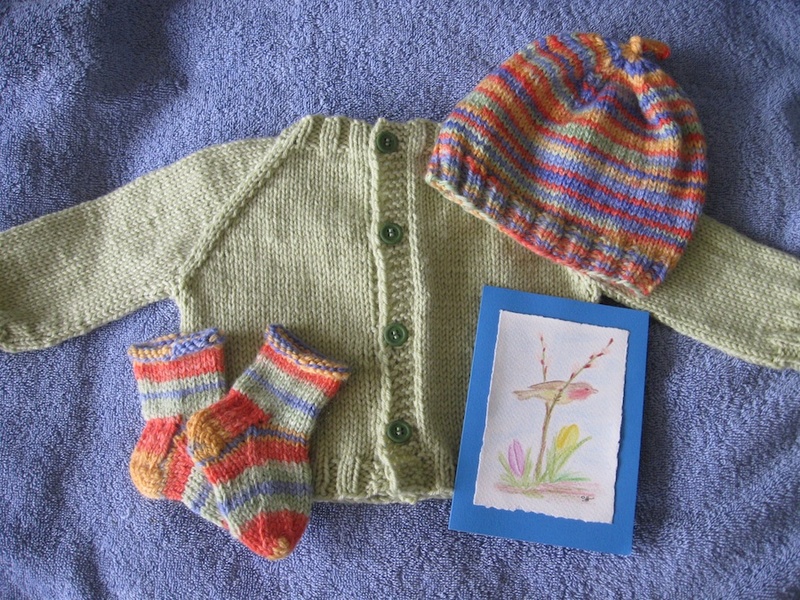 Beautiful baby knits. Hope you feel better soon.